The longest venomous snake in the world, the king cobra, can find itself on the other end of the food chain. Beneath the leaf litter in one of India’s southern forests, a nest of royal predators are working to join the world. They are the longest venomous snakes in the world - King Cobras. 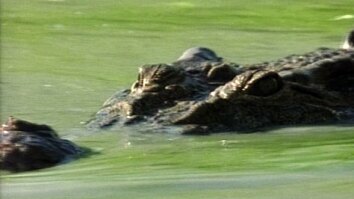 Though they may grow to be 18 feet in length, these babies are a mere 15 inches long. Despite their diminutive size, they already look and act like their parents, equipped with all the skills necessary to survive in their new environment. But these skills won’t be enough to assure survival…and while the rest of his brethren head high above for safety, one small snake slithers for the water and a thirst-quenching drink. Unfortunately, fate is not on his side. Another pint-sized predator is on the look-out for food, too. 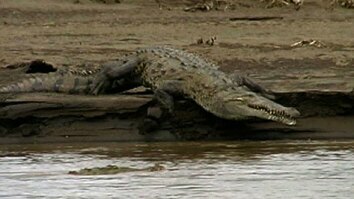 The saltwater crocodile is a legendary giant of these forests. This species is the largest living reptile in the world. Adults can grow well over 20 feet long and weigh in at over a ton. 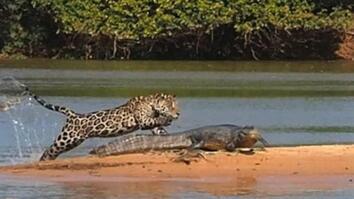 Crocodiles are opportunistic hunters, lying in wait for an unsuspecting animal to come along…like the baby king cobra. The snake's misguided instinct is a windfall for the little salty who swiftly snaps up the little king cobra, and enjoys an unexpected snack.